Rafael Nadal of Spain celebrates winning the 2013 U.S. Open at the USTA Billie Jean King National Tennis Center in Flushing, Queens. Rafael Nadal’s absence from the U.S. Open creates a big opportunity for Roger Federer, his chief rival for greatest men’s tennis player of all time. Nadal announced Monday that he’ll miss the Open with the right-wrist injury that has sidelined him since Wimbledon. Even a recovering Nadal would have created problems for Federer in the year’s last Grand Slam tournament, which starts next week. Nadal has won 23 of their 33 career meetings, including the last six in major tournaments. And if Nadal entered, Federer would have been seeded third, meaning he could have had to beat Nadal and No. 1 Novak Djokovic to win the title. Federer hasn’t beaten Nadal at a major in over seven years, and Federer’s last four Grand Slam titles have come with Nadal absent or upset early. Without Nadal, the Open draw looks very friendly for Federer. He has lost 44 times in Grand Slam tournaments in his career, but just 14 of those losses were to players in the U.S. Open singles draw — and just eight were to players whom he could meet before the final. The other six are to Djokovic, including in the Wimbledon final last month. But the world No. 1 has struggled since then in U.S. Open warmup events and is far from a sure thing to reach the final. “Many, many, many things are not clicking,” Djokovic said after his latest loss. Oddsmakers have Djokovic as the favorite and Federer as second favorite. Winning the U.S. Open would cap Federer’s consistent excellence since he stumbled out of last year’s Open in the Round of 16. He has reached at least the semifinals in 12 of 16 events since then, including nine finals and three titles. He won 15 of 23 matches against the top 10 during that time — losing in straight sets only to Nadal. All that winning has lifted Federer’s ranking from seventh to third. Federer would overtake Nadal for second in the rankings if Federer wins the U.S. Open title, making it even harder for Nadal to add to his career count of weeks at No. 1, currently less than half Federer’s total of 302. Nadal’s absence also sets back his chances of overtaking Federer for the most career Grand Slam titles. Nadal has 14, tied with Pete Sampras for second behind Federer’s 17. What makes Nadal’s career achievements more remarkable also jeopardizes his chances of adding to them: his propensity to get injured and miss chances to add to those achievements. Nadal has missed at least one major tournament due to injury in each of the past three seasons, and seven overall since his first in 2003. Federer has played in a record 59 straight majors. The U.S. Open didn’t used to be a promising venue for Nadal, but he has made the final the past three times he played, winning twice. Federer, meanwhile, hasn’t reached a final in Flushing in five years. Federer and Nadal have never played each other at the U.S. Open. 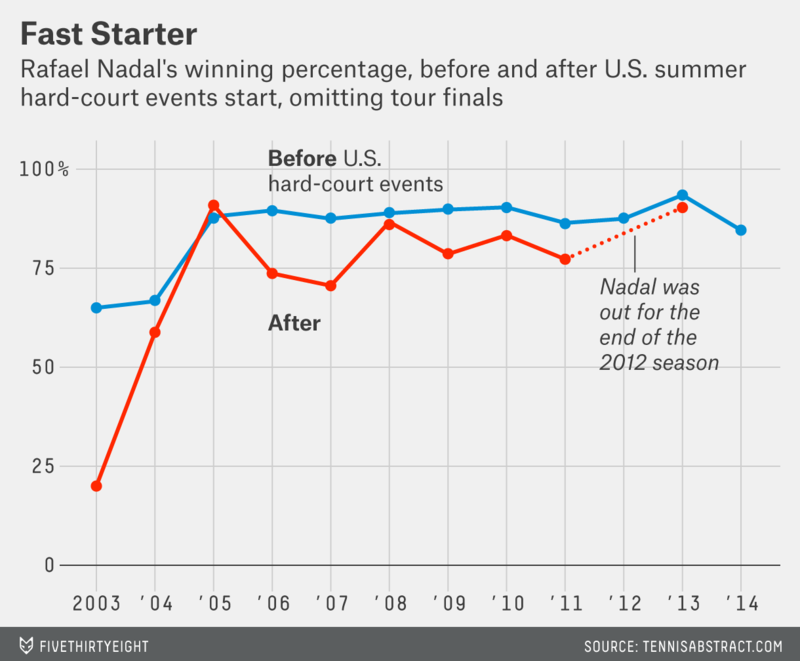 For years, Nadal lost too early in the tournament; then, Federer did. They came oh so close last summer. Federer needed only to beat Tommy Robredo for the 11th time in 11 meetings. He failed. Nadal’s absence this year makes an eventual Federer-Nadal meeting in Flushing look even more unlikely, at least until they’re retired and playing exhibitions. Missing this portion of the season would have been no great loss for the Nadal of 10 — or even five — years ago. From 2003 through 2009, his winning percentage during the part of the season before the U.S. summer hard-court tournaments was nine percentage points higher than it was for the rest of the season (omitting the World Tour Finals, since it’s contested only among the highest ranked players so it makes for an unfair comparison). But since 2010, he has narrowed that gap to just 5 percentage points, including just 2 percentage points last year, when he swept the summer events on the hard courts of Montreal; Mason, Ohio; and Flushing, in Queens. Nadal fans shouldn’t feel too sullen, though. In his Facebook announcement Monday, Nadal said, “Not much more I can do right now, other than accept the situation and, as always in my case, work hard in order to be able to compete at the highest level once I am back.” After previous injuries, Nadal has provided ample evidence to suggest he means the part about “the highest level.” This is Nadal’s fifth extended absence since reaching ATP World Tour level in 2003. After the first, because of an ankle injury in 2004, he struggled, going just 4-4 in the next four events. But since then, Nadal has waited to return from injury until he is ready to play near his best. After missing the end of 2005 and start of 2006 with a foot injury, Nadal went 11-3 in his next four events — then swept the following four tournaments. He was 13-4 in his summer 2009 comeback from tendinitis in his knees. And last year, he shook off a seven-month absence from more knee tendinitis to go 17-1 in his first four events. When Nadal’s chief rivals have been injured, they’ve played themselves back into form on tour. Andy Murray struggled after missing time with a wrist injury in 2007, losing three of his first six matches. He hasn’t reached a final since returning this year from back surgery. Djokovic was injured after the U.S. Open in 2011, returned that fall and was far from his best. Federer carried a back injury through part of last season, which contributed to his struggles. Nadal, though, prefers to wait until he’s sure he’s ready. So he’s likely to pose a threat at whatever is his next tournament — especially to Federer. CORRECTION (Aug. 19, 2:51 p.m.): An earlier version of this article said Nadal won a title in Toronto last summer. He won in Montreal.